With five cameras in tow in a spider-like design, the Nokia 9 PureView from HMD Global stands out from the crowd of smartphones coming out of Mobile World Congress 2019 in Barcelona. The five cameras work in unison to produce photos rich with information, which you can then edit to your heart’s content as the phone provides RAW files alongside traditional JPEG ones. It’s meant for photo enthusiasts, not necessarily a mainstream audience, which may partly be why it’s a limited edition phone. While there’s a lot to like, there are features and omissions we dislike. Let’s take a look, and if you want our in-depth impressions, check out our Nokia 9 PureView hands-on review. We’ve seen phones offering RAW files alongside JPEG before, like the Pixel 3, but each camera on the Nokia 9 PureView (which we’re just refer to as the Nokia 9 from here on out) captures a photo, which is then stacked on top of each other to deliver a ton more data than photos from standard single- or dual-camera lenses. The difference in editing a RAW photo from the Pixel 3 versus editing one on the Nokia 9 is immediately noticeable, just because you have more to work with. It’s also helpful that Adobe will support the Nokia 9’s lens profiles in Lightroom, which would deliver greater image quality. Photographers know the benefits of shooting in RAW, and the Nokia 9’s rich photos make them fun to edit. A lot of cameras on smartphones have camera bumps, where the lens protrudes from the back of the phone; the iPhone XS is a good example. That can sometimes make the phone not lie completely flat when placed on a table. It’s not a massive problem or a dealbreaker, especially since a case can resolve this, but we’d like to highlight phones that make an effort to ensure this design flaw doesn’t exist at all, and the Nokia 9 is a winner here. Despite having five cameras on the back, there’s no camera bump — it’s completely flat, and that’s impressive. One of the coolest features of the Nokia 9 is how the five cameras can capture more than 1,200 layers of depth. Not only does that offer a more natural-looking bokeh (blur) effect, but you can also use Depth Control in Google Photos (the default photos app) to refocus images. So if you take a photo and the focus is on the background instead of the subject, just tap the subject and the focus will shift. You can then increase or decrease the level of blur in the foreground or background, producing photos that look like they were captured from a DSLR. It’s a lot of fun. 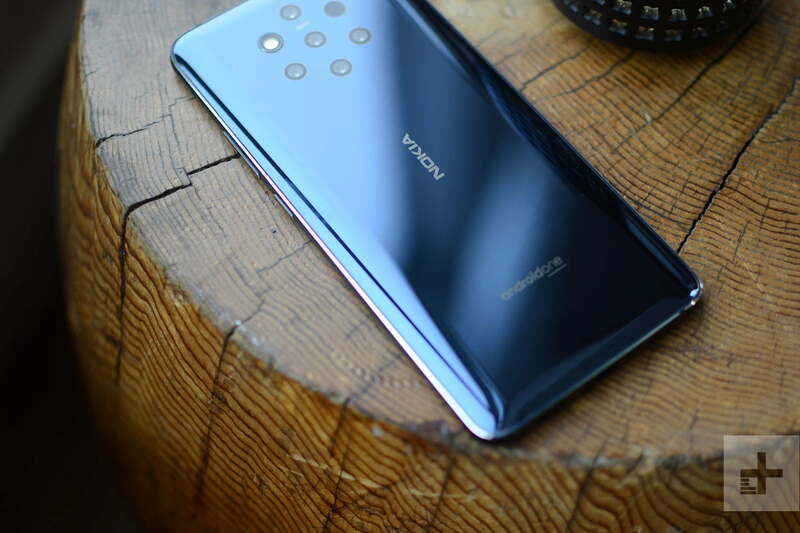 Regardless of the cameras, the Nokia 9 has to fulfill its duties as a smartphone first. Thankfully, the phone is a part of the Android One program, so you’re getting no bloatware, clean stock Android that’s simple to use, on top of a promise of fast version updates for two years, as well as security updates for three years. Sure, it’s using last year’s Snapdragon 845 processor, but the Nokia 9 can still handle almost anything you throw at it. To continue letting those creative juices flow, the Nokia 9’s camera app comes with a Monochrome and Pro camera mode. Three of the lenses on the back are actually monochromatic sensors, because they can capture up to 2.9 times more light than RGB sensors. So when you swap to Monochrome mode, the camera fuses three photos from the three monochromatic sensors into one, and the end results often look gorgeous. Having a true black and white mode is so much better than using a filter, and it can make you want to try different perspectives when shooting. There’s also a Pro camera mode that lets you control shutter speed, ISO, and exposure. This is present on most HMD phones, but the Nokia 9 goes a step further as it can now capture 10-second long exposures. Just set the phone on a tripod and swap to the 10-second long exposure when in the dark, and then see the Nokia 9 illuminate your surroundings, just like a DSLR. There are other phones and third-party camera apps that can achieve this, but paired with the rest of the photographer-friendly features, the Nokia 9 becomes a different beast. The Nokia 9 saves a JPEG and RAW photo every time you snap a shot. The JPEGs are automatically backed up in “high-resolution” (as opposed to the original resolution) for free on Google Photos. The RAWs will end up eating into your free Google storage space, and we expect you’ll eventually need to purchase more cloud storage from Google as you snap more photos on the Nokia 9. The phone does come with 128GB of internal storage, but a MicroSD card slot would have gone a long way to helping photographers expand storage internally, rather than having to jump on a monthly subscription storage plan with Google. The biggest downside of the five-camera setup is the time the phone takes to process a photo. You get a preview as soon as you tap the shutter button, but you can’t do anything with it until 30 seconds later (sometimes more), as that’s just how long it takes to fully fuse and display these detail-rich images. It’s not a dealbreaker, but it may prove frustrating to some who want to quickly share photos to social media. What also may prove annoying is the lack of optical image stabilization. Granted, it’s tough to implement when there are five cameras on the back. Even Samsung’s triple camera Galaxy S10 lacks optical image stabilization in the ultra wide-angle lens. So if you have shaky hands or are shooting a subject that moves a lot, the Nokia 9 may offer more blurry photos than not. More and more phones have in-display fingerprint sensors, which is when the fingerprint sensor is placed under the screen on the front of the phone. Different manufacturers use different technologies, and so far we’ve had little to no issues with Samsung’s Galaxy S10 and S10 Plus, which uses ultrasonic tech for its scanner. The OnePlus 6T and Huawei Mate 20 Pro’s sensors failed quite frequently for us, and we had some issues with the sensor on the Nokia 9 after setting it up briefly, which isn’t promising. Thankfully, there is a face unlock option, but it’s meant more for convenience and not security. If we could make it a rule, we’d ban bottom-firing speakers. Take a cue from Google and Razer and make speakers on flagship phones stereo and front-facing. It’s easy to block the speaker on the Nokia 9 because the sound only comes from the bottom, and that can mean shifting how you hold the phone to avoid this problem. There are already small bezels around the screen, so we’re not sure why HMD couldn’t put the bottom-firing speaker on the bottom bezel at the least. Likes and gripes aside, we’ll be putting the Nokia 9 PureView through its paces over the next few weeks, so stay tuned for our full review.